The Funeral Service to Celebrate the Life of Jela Silic of South Guildford will be held in our Chapel, cnr Brockman Rd and Great Eastern Hwy MIDLAND on THURSDAY (18.04.2019) at 9.15am. At the conclusion of the Service the Funeral Cortege will proceed to GUILDFORD Cemetery for a Burial Service at 10.30am. 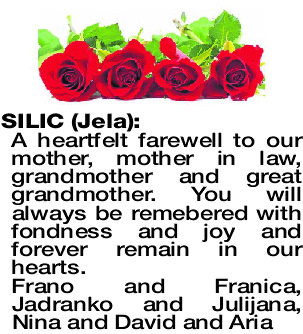 SILIC JELA A heartfelt farewell to our mother, mother in law, grandmother and great grandmother. You will always be remebered with fondness and joy and forever remain in our hearts. In loving memory of our dear cousin. Deepest sympathy to Jovo, Frano and families. Tade, Violet and family. Rest in peace dear Jela. SILIC JELA In sympathy to Jovo, Frano and family for the loss of a dear Mother and Grandmother. A beloved Cousin, we shared sadness and much happiness over 48 years. I will miss you every day and will always hold you close in my heart. Senka, Pere, Helen, Ivan and families. Deepest sympathy to Jovo, Frano and families. Loved cousin of Ivan and Maria Franich and family. Treasured memories and your kindness to all will never be forgotten Sitna. SILIC JELA Deepest sympathy to Jovo, Frano and families. Loved cousin of Ivica Unkovich (dec) and family. Treasured memories of your kindness will remain in our hearts. Anne, Ivan, Tilly, Tony and families. SILIC JELA Wonderful and treasured memories of our much loved and dear friend. Our love and condolences to Jovo, Frano and families. Mili and Iva Zuvela together with Frank, Lina, Sandra and families. Condolences to Jela's family on their sad loss. Many memories of a kind and generous friend to the Boyanich family.